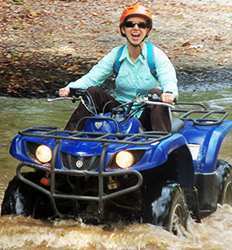 Whether you want a short ATV tour through the tropical dry forest surrounding the Gulf of Papagayo or a full day off-road adventure in the Guanacaste Mountains, Papagayo ATV tours has an exciting off-road adventure just for you! 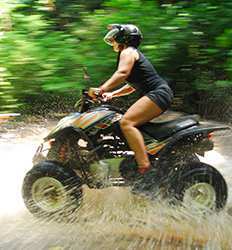 Power your ATV through Guanacaste's tropical dry forest and splash through rivers on a short half day ATV tour in Papagayo, or add a bit of zip to your Off-Road action on the Papagayo ATV & Canopy combo. Still not enough horsepower for you? We have a full day of adrenaline pumping action for you on the Borinquen Mountain Adventure! At The Real Deal Tours, it's our #1 mission to bring you the most fun at the fairest price, every time! 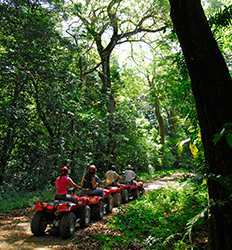 And since we offer only the best ATV tours from the best tour operators in Costa Rica, you've definitely come to the right place! 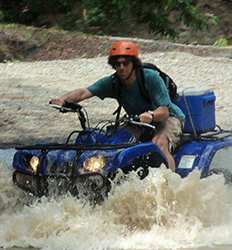 Browse below through our list of Papagayo ATV tours and choose your favorite off-road adventure in Costa Rica. Prepare yourself to experience one of Costa Rica´s most ecologically diverse areas! As you explore the jungles and villages you can rest assured that the Costa Rican government is doing its part to protect the beautiful Papagayo Peninsula. With over 70% of the region protected, you can be enjoyed in a natural state. ¡Pura Vida!